With more and more offices choosing to opt for this sort of layout when designing new spaces, I have been coming up against the problem of privacy time and time again. So below are a few options / ideas that could help if you want to find a balance between privacy and collaborative working spaces. The obvious option to create privacy in an office is to build meeting rooms with partitioned walls, however most businesses do not own the buildings that they are situated in, meaning if they ever came to the point of leaving they would have to pay dilapidations to the landlord or pay to put the building back how they found it. Because of this many companies would rather stay away from building fixed partitioned walls and instead bring in meeting room pods as they don’t form part of the building, can be dismantled very easily and don’t cause damage to the office environment. What is brilliant about meeting room pods is there versatility, they can be used for almost any office meeting situation. However, focusing on benefits for privacy, the pods primary design is aimed at creating a space that is separate from the rest of the office. All the walls are sound insulated and both inside and outside skins can be customised to what every spec the buyer would like. The only real issues with these pods are 1) The cost, they are very expensive, 2) personally I feel they may become dated very quickly and 3) you need a very large amount of space to install one. 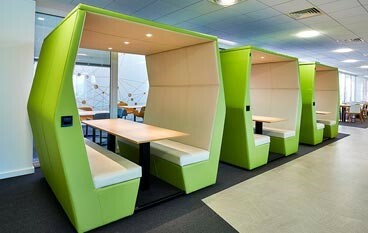 But over all if you are looking for private areas in an open plan office, this is the best option. Other option for a smaller office or firms with less capital, is to look at creating designated quite areas…much like a library. 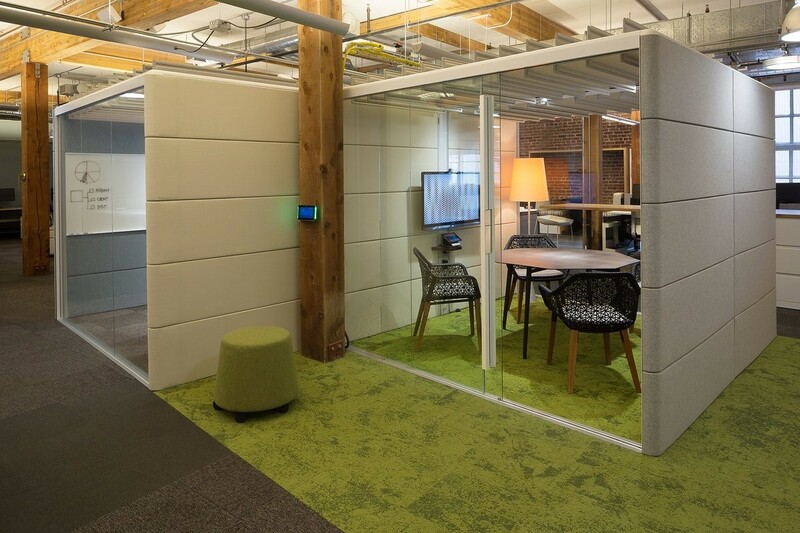 This can be as simple as a hot desk with a sticker saying “quite zone” on it or they can be funky personal pods that give the user the sense of privacy they need without shutting them off completely from the collaborative office atmosphere. If cost is the primary decision maker, quite areas are much more cost effective than building meeting room pods and they will probably be used more. However, if a user wanted to have a confidential finance meeting or they needed to disciple a member of staff for example, this solution wouldn’t work due to the lack of sound cancelling. Looking over our current orders, the amount of “mobile furniture” being bought has increased dramatically. 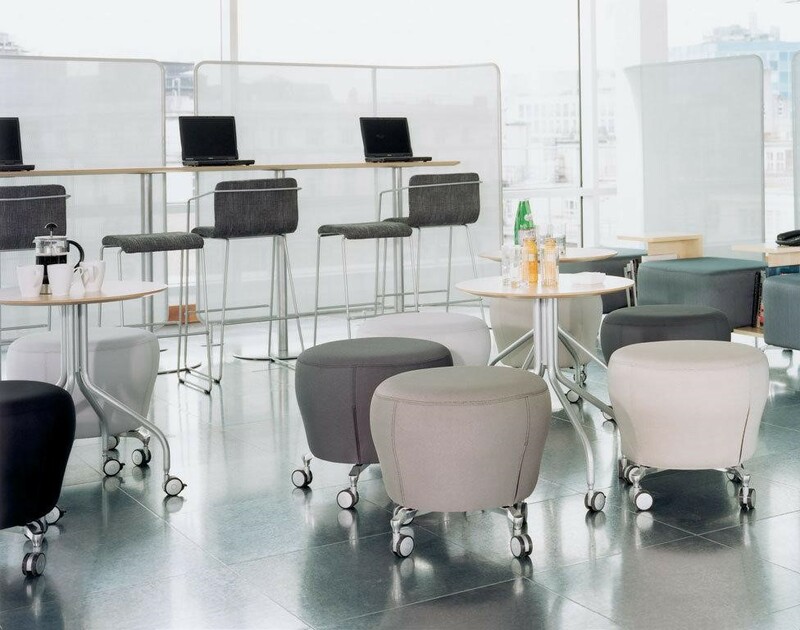 Not so much for sound purposes or for direct privacy but these items are being purchased so groups of employees can “wheel themselves” away into their own private meeting space within an office environment. This style of office furniture gives the user the ability to take themselves away to a private space where they may want to be away from the maddening crowd of the main office. Again, being realistic, other employees are going to see & hear the users, so for direct privacy in a collaborate space it’s not the perfect solution. However, if the furniture’s purpose is simply for employees to pull themselves or colleagues away to discuss a drawing or a file for example, it’s a very cost-effective way of achieving that. 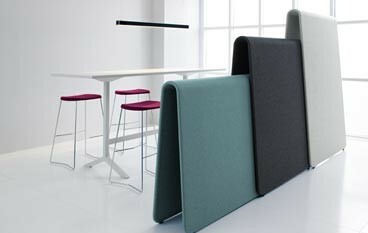 Not as fashionable as it once was, sound cancelling furniture such as “dividing screens” are an extremely cheap and effective way to create private areas within an open plan office. They can be as simple or as complicated as you want to make them. Almost every manufacture of office furniture sells a form of these screens, so they are very easy to get hold of and most manufactures are competitive with prices. But if you need an effective simple and cheap way to create privacy in your open plan office, this is a great way to do it.